New York City Board Votes to Freeze Regulated Rents on One-Year Leases - NY Times Tenants chanted before the city’s Rent Guidelines Board voted on Monday at the Great Hall at Cooper Union for the Advancement of Science and Art in Manhattan. HIROKO MASUIKE / THE NEW YORK TIMES 104 By MIREYA NAVARRO JUNE 29, 2015 The board that regulates rents for more than one million rent-stabilized apartments in New York City voted on Monday night for a freeze on one-year leases, an unprecedented move in its 46-year history. The 7-to-2 vote by the city’s Rent Guidelines Board was an acknowledgment of the precarious situation of many tenants whose incomes have not kept pace with housing costs. It also was the first decision on rent levels by a nine-member board appointed in its entirety by Mayor Bill de Blasio. 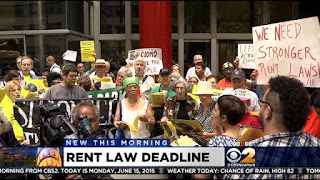 Cuomo fails tenants again as Assembly is left without a Democratic partner in rent law negotiations. Sweetheart deal for landlords will hurt working families; eliminate nearly 90,000 units of affordable housing. (Albany) Despite the hope of millions of rent-regulated tenants that Albany would finally stand up to the corrupting influence of landlord money, today’s passage of the Cuomo/Flanagan proposal on pro-landlord rent laws deal proves that Albany is just as dysfunctional and money-driven as ever. The Assembly, whom many housing advocates had hoped would be a bulwark against further loss of affordable housing, apparently caved in when it became clear that the Governor and Republican Senate would not yield to tenants’ interest. Tell Cuomo to go back to the drawing board. Tentative rent law deal doesn't do much for tenants. Tell Cuomo! Repeal of vacancy deregulation Rent at which vacant apartments can be de-regulated goes up from $2500 to $2700. That amount is indexed to the RGB annual percentage change, if any. MCI and IAI increases Major Capital Improvement and Individual Apartment Improvement rent increases (now permanent) Limit the increases to end when the cost of the improvement has been re-paid. Tenants in Albany keep pressure on Gov. 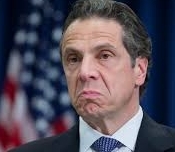 Cuomo. Call him now! CALL or EMAIL the GOVERNOR: 518-474-8390, ext. 3. I'm a tenant, and I need you to repeal vacancy deregulation, cap improvement increases, cut vacancy bonuses, and end preferential rent loopholes. I rely on your action NOW. KEEP CALLING AND EMAILING GOVERNOR CUOMO. 518-474-8390 ext. 3, and email (even if you've done it recently). Actions until we get reform! IT’S THURSDAY, JUNE 18, 2015. NO RENT LAWS YET. Beware of New York State Republicans bearing gifts. 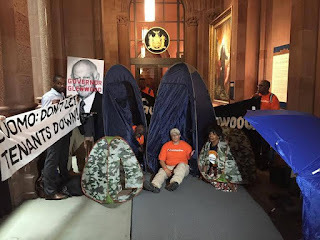 Join Brooklyn Borough President Eric Adams with your sleeping bag and PJs tonight (June 17, 2015) in front of Gov. 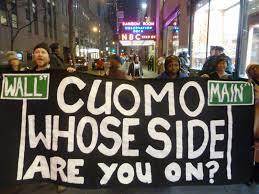 Cuomo's NYC office, 633 Third Ave. (between 40th & 41st Streets). 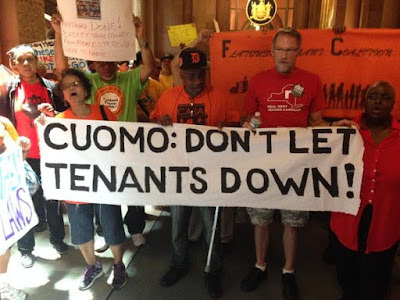 Tenants to Cuomo: Meet with us (as you did with real estate) NOW. Since Governor Andrew Cuomo has refused to stand with tenants and instead is standing with developers and landlords, tenants will be doing a camp out in front of Cuomo’s NYC office at 633 Third Avenue today at 12:00 noon to send a message to Cuomo that if he doesn't strengthen the rent laws, 2.5 million New Yorkers will be at risk of losing their homes. Governor Cuomo: Stop playing games! Fight to repeal Vacancy Decontrol! 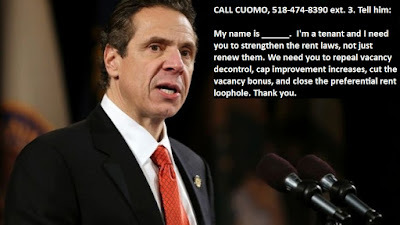 Get your members, your friends and neighbors to call Governor Cuomo, and call yourself, even if you have called before. 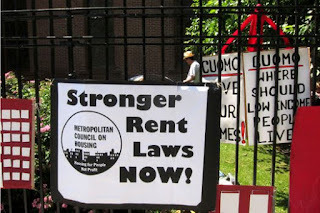 Tell the Governor that you will hold him responsible if the rent laws are not strengthened. Call (518) 474-8390, press 3. Since landlords want rent regulation renewed "as is," that is the least tenants can expect. We want Albany to do more - or we will lose more than 35,000 apartments a year until the laws are substantially strengthened and vacancy decontrol is repealed. You may have heard news about New York's rent regulation laws potentially expiring tonight. THIS ISSUE IS NOT WHETHER THE RENT LAWS WILL BE RENEWED – THEY WILL BE. The issue is whether the rent laws will be strengthened. Gov. Cuomo and the Senate Republicans are trying to create a sense of panic so everyone will breathe a sigh of relief when the laws are renewed in their current weakened form. Don't fall into this trap. STRONGER RENT LAWS NOW! A broad agreement on expiring issues such as rent control for New York City and the surrounding area, as well as the 421a tax abatement, is yet to be reached. VIGIL: SUNDAY 6-9 PM Cuomo's Manhattan office, 633 Third Avenue, between 40th & 41st Streets. The State Assembly is back inAlbanyfor a conferenceSunday, June 14that6:00 pm, to hear a report on where things stand and make decisions forMonday.